Because the Hart Trophy only has three spots available, competition is pretty fierce. As a result, only Sidney Crosby, Connor McDavid and Sergei Bobrovsky got the nod this year. Across the league, there are plenty of names that could have been featured. Today we are looking at players from the Pacific division who deserve to be their team’s Hart Trophy nominee. Make sure to check out Mike Laybourne’s picks for Atlantic Hart Trophy Nominees as well. Where would the Ducks be without their leader? Getzlaf once again was the glue that held the franchise together. While he was behind Rickard Rakell in scoring with only 15 goals, the 32-year-old had an amazing 58 assists for 73 points! During the Ducks great run to the conference final, Getzlaf’s leadership shone through and again he was top scorer with 5 points. The fact he hasn’t won a Hart Trophy yet is frankly baffling. After another dull and lifeless season at the Gila River Arena, the return of Radim Vrbata was a ray of light. Top scorer with 55 points and topping team stats in each offensive category Vrbata easily stood out amongst a low-quality roster. A likely candidate to take ‘C’ when Shane Doan retires, Vrbata has proven he still has the ability to produce. Just a shame the rest of his team cannot step up as well. Johnny Hockey might have been the focal point of the team, but Monahan has emerged as a real blue chip prospect. 58 points saw him finishing marginally behind Gaudreau, but the 22-year-old found the net more with 27 goals. This year he became the youngest Calgary Flames player to score over 100 goals- beating Joe Nieuwendyk‘s record. Now his team’s alternate captain, you get the sense that we are looking at a future franchise leader. Who else could it possibly be? Already a Hart Trophy nominee and winner of the Art Ross after a brilliant 100 point season, McDavid IS the Oilers future. Made the youngest ever team captain, McDavid has turned this side into a different team. After their exit during the Conference semi-final, we were cruelly denied the Crosby-McDavid showdown. If ever a player has earned the ‘Next One’ title, it’s truly this guy. Wayne Gretzky might start to get nervous soon. Love or hate Jeff Carter, you can’t deny he has been great for LA. Scoring over 66 points and in generally looking like a prime attacking threat, Carter was a highlight of an underwhelming Kings team. He hasn’t always made friends on or off the ice, but he has always come up trumps for his team. Still a fan favourite, Carter isn’t likely to be leaving the Staples Centre anytime soon. When his name was left off the Hart Trophy list it left many hockey fans surprised. Burns has a career season and has finally emerged as one of the league’s best blueliners. Top scorer for all D-Men in 2016-17 with a staggering 76 points, Burns is a hot favourite for the Norris Trophy but will face a hard fight against Erik Karlsson. 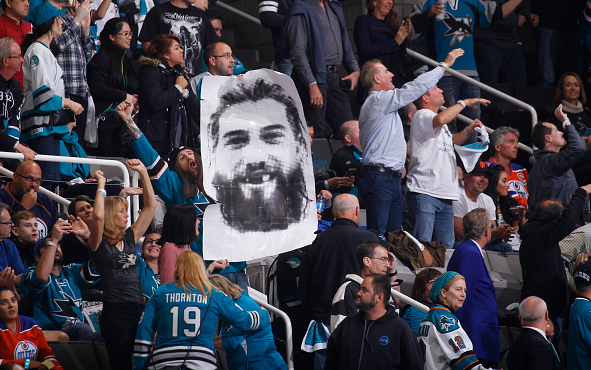 The Sharks playoff run was cut disappointingly short in the first round, but you can bet Burns will keen to rectify this next year. Beating out the Sedins to be top scorer is not an easy job in Vancouver. Bo Horvat managed it this season and has emerged as their lone attacking threat. During a tough rebuild for the Canucks, the 22-year-old Ontario native was selected to his first All-Star game. The Canucks have a potential leader in their midst, they just have to be careful not to trade him away. Next season will tell if he is the read deal. Those are our picks for each team’s MVP. Are you a fan of a team in the Pacific Division? Who would you pick? Comment below or join in the conversation on Twitter.